Autumn is a great time of year for dogs…and people too. The weather has cooled but usually isn’t too cold to enjoy being outside. And then there’s the excitement of all the upcoming holidays but there are also Fall dangers for your dog. Keep Antifreeze Away: The autumn season is a time where people clean their cars’ radiators or top them off with more antifreeze. 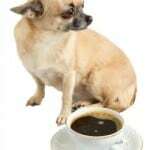 Some older varieties of antifreeze taste sweet and dogs are attracted to it but it’s deadly for them. Less than a tablespoon can be fatal. 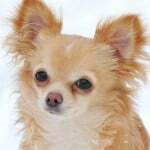 Do not let your dog drink from puddles by the roadside, you never can tell, a car may have leaked some antifreeze there. Watch out for Mushrooms: Autumn is a favorable season for mushrooms to pop up. The problem is that those yummy looking mushrooms are really toadstools and are probably toxic. Curious dogs may try to eat them or just play with them. Either way get rid of them as soon as you see them in your yard and be on the lookout for them when walking your dog. Allergies: Just as you may respond to some environmental changes in the form of allergies, so does your dog. Allergies in dogs seem to flare up more often in the Spring and Fall. If you find your dog scratching more than usual, maybe it’s time to visit the vet for possible causes. 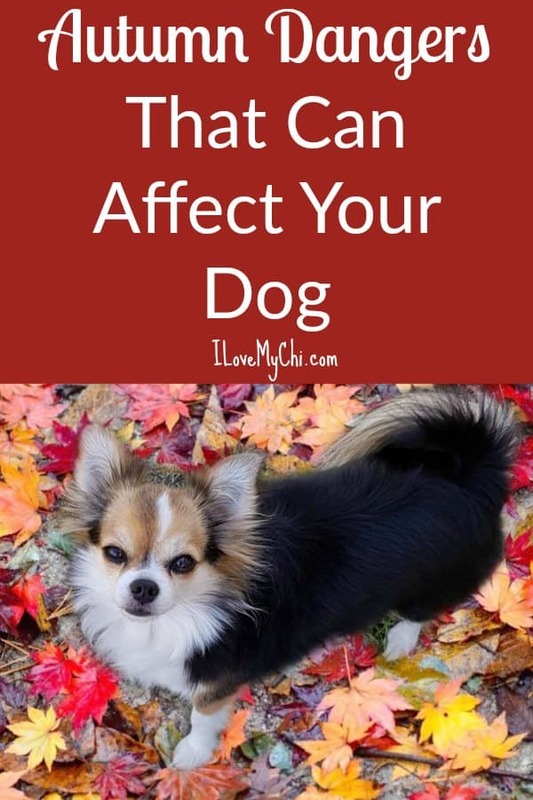 And do make sure the grass is kept low and the leaves are raked to remove anything that may cause skin irritation to your dog. Keep Pests and other Dangerous Away: The fall months are known for many kinds of pests, typically ticks, fleas, snakes, skunks and raccoons preparing for hibernation. Be careful about where your dog plays especially roaming through long grass. If you are taking a walk in the woods or fields,you might be tempted to give your dog some space to run. Better to keep them on a long leash so you can monitor where they are going. Watch out too that they aren’t eating animal poop on the ground. It can carry parasites and diseases. When you get home, check them for ticks and fleas. Even if they are on flea and tick prevention, they can still pick them up. Bundle Up: We all know chihuahuas do not like the cold. So be sure to put a sweater on your chi on chilly days, specially when they are outside. And keep a few extra blankets around for them to burrow in. Poison: This time of year, rodents are wanting to come inside to nest for the cold months. Do not use bait traps and poison to get rid of them. If they come out in the open to die, your dog could eat them and in turn get sick. 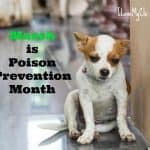 Unfortunately even if you aren’t using poison to kill rodents, your neighbors may be so keep an eye on your dog, even when they are in your backyard. 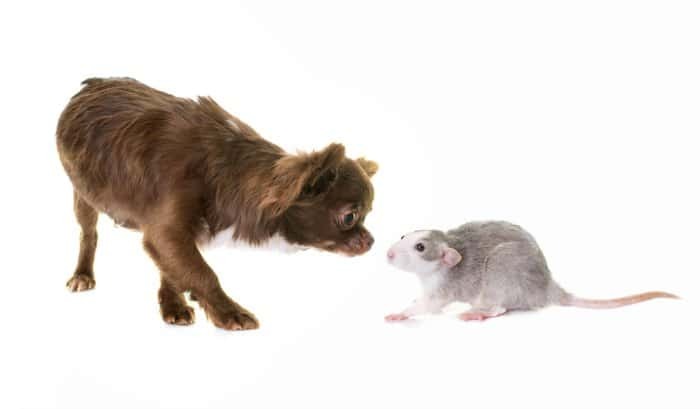 Rats, mice and squirrels can drop the bait into your yard, or come to your yard to die. Back-To-School-Precaution: Autumn marks children’s return to school. What this means is that if you have kids at home pencils, crayons, markers, and other school supplies may be left laying around the house. Make sure these supplies are not within reach of your dog because some types of glue, markers and crayons can be toxic to your dog and small objects can cause choking. Halloween: If you take your dog out trick or treating, be sure they have something reflective on them (such as a reflective leash, collar or costume). If your dog is a chewer be careful about putting Halloween costumes on them that they can get to and chew off bits of the costume. Of course, please keep Halloween candy away from the, especially chocolate which can be deadly to dogs. 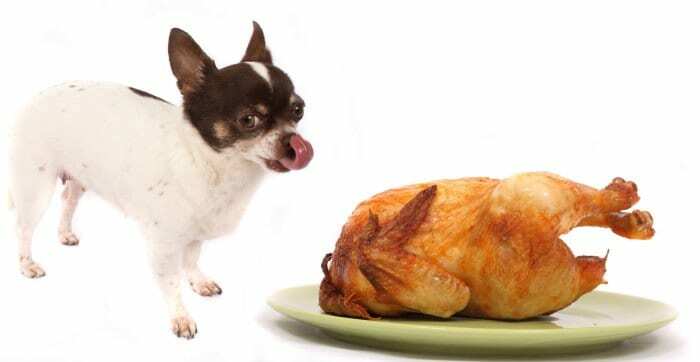 Thanksgiving: With so much food around, it may be tempting to share your feast with your pup, but only give them a bite or two. Too much will give them diarrhea or worse yet, the bloat. Christmas: If you have a live tree, be sure to not let your dog near it unsupervised. The sap that accumulates in the water used to water the tree can be toxic. Also ornaments and the hooks from ornaments can be a danger. 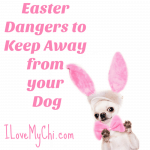 And again, with the extra food and sweets around, keep it away from your fur baby. 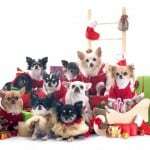 We have a more indepth article here on Holiday Dangers for Dogs. I hope reading about all of this doesn’t scare you away from the beauty and wonder of Autumn. It’s a wonderful time of year and with a little extra care and observation, you and your dog can have a great time of it. 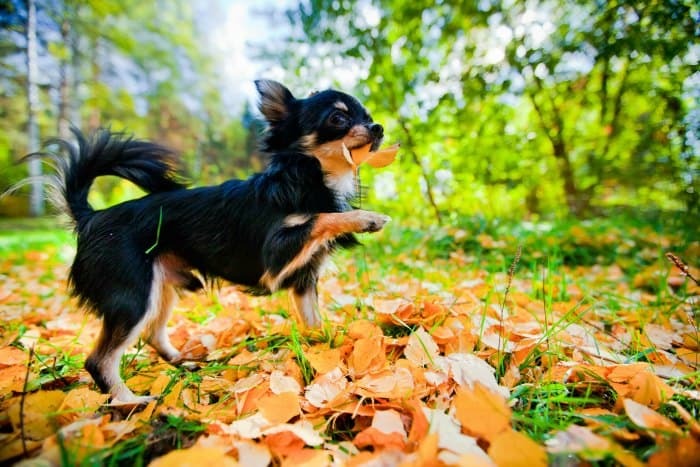 Does your dog like Fall? Do you? Love the tips of allergies in the fall and winter months. My Chi isn’t having to much going on but my yorkie is having skin problems. This was helpful for her too. Glad you liked it Shannon. Hope your yorkie feels better soon.